The most beautiful of the dolmens in this part of the country is certainly Clooneen. Borlase’s view, though quite accurate, does not give any idea of its fine proportions; his plan is good. It lies in a dilapidated carn, and is a tapering cist of very regular slabs; its cell, 15 feet 3 inches long, 5 feet 6 inches to 3 feet 2 inches wide, and 5 feet 6 inches high. The cover is over 15 feet by 8 feet and 10 inches thick. A fence of slabs lay outside to the north, and a kerbing girds the mound. Such slab enclosures are no uncommon features in Co. Clare, as I have recorded their occurrence at a now levelled ‘long dolmen’ at Milltown, near Tulla, at Newgrove, Ardnataggle, and perhaps Killokennedy in eastern Clare, and at Iskancullin, Deerpark, and Clooneen. There is a small hole pierced in the south side-slab and the tops of the sides are hammer-dressed. 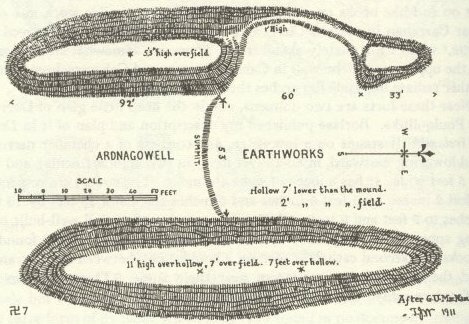 The most problematical of the early earthworks of Clare is certainly that on Knock Ardnagowell, a low green rise in the shale land, not far to the south of the road from Lemeneagh to Kilfenora, in the townland of Ballyclancahill. It is a conspicuous object from the north and the south, consisting of two great parallel mounds over the saddle of the hill, but is not marked either on the old or the new maps. The mounds are 53 feet apart or 98 feet from top to top; they run north and south, looking in the distance like an old wide embanked road, on the summit of the ridge. They are respectively 185 feet and 198 feet long, the western being usually 40 feet thick, 5 feet 3 inches over the hillside, and 11 feet over the interspace; the eastern is 45 feet thick and of equal height. The western runs for an even distance about 92 feet down each slope of the ridge and is dug into for 60 feet, leaving the outer edge only about 3 feet thick and a foot high. An old roadway runs to the south at 70 feet from the western mound, and a large boulder, 15 feet across, lies between it and the western mound. The ends die away into the slope, and nothing suggests that the works were joined by cross-mounds or loops. There is no tradition as to its nature. It is too wide for a road, too short for a mearing, too open for a fort, and being over a summit is of course unsuited for a reservoir, even if dew-ponds or artificial tanks were found in western Ireland. As we have seen, the ridge is slightly lowered between the mounds. I commend the problem of this strange work to other antiquaries. A conspicuous little tumulus stands on a ridge in Clooneen. It is 46 feet in diameter north-east to south-west, and 40 feet across, being oval. It is only 5 feet high; large blocks crop out of the sod, especially near the top. I limit this paper from Lemeneagh onward to the antiquities lying immediately south of the Kilfeneora road. Beyond these limits to the south there is but little to describe. Forts are few, and nearly all of the common type, about 100 feet across, of earth with rare traces of stone-facing and a fosse and low rings. The only ones worthy of any detailed notice about Milltown, Cahermurphy, and in the ‘Irrus’ peninsula from Loop Head to Dunbeg I have already described. Of dolmens, only those of Carncreagh and Callan and the problematical Ogham slab near the last needed and received notice. 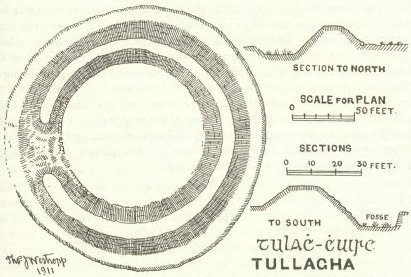 Two of the earthen forts lie near the road opposite the cross-road leading past Ballykinvarga, Noughaval, and Cahermacnaughten to Ballyvaughan; they are in Tullagh (locally Tullagha) townland, probably the ancient Tulach Chuirc. The one nearest the road is 220 feet over all, and is a mass of beautiful green sward, rising 13 feet over the fosse, which is 6 feet deep and 15 feet wide, with no outer ring. It is nearly filled up on the east and south, and is still wet in parts and filled with yellow iris. The rampart is 31 feet thick at the field-level to the south, and rises 6 feet over the garth; it is 41 feet thick at the base and 12 feet on top to the north. There are three gaps, two very shapeless and narrow, the third faces the east and was probably the ancient entrance. The garth is 117 feet across and nearly a true circle; it has been tilled, and is now much overgrown with docks. The rampart was once evidently faced by revetments of large regular sandstone blocks, but few traces remain, save along the inner foot of the mound. The earthen fort on the low rising ground of Knockalish lies about 400 yards away to the south-west. It is 150 feet across, but of little interest. I have already described the more noteworthy forts of Kilfenora parish, Doon, Ballykinvarga, Ballyshanny, and Caherminaun. Doon was very probably the Tech nEnnach, the dún made by Ennach, son of Umor, on the river Dael, which rises from the ridge on which this great rock-cut fort sits imposingly, dominating the view from Roughan and the Tullycommaun ridges to far out to sea. Caherballagh is a featureless ring planted with hawthorns near Lough Ballagh. Cahersherkin is only a small defaced ring-fort. The Down Survey, circa 1655, shows near it a large rectangular fort which is not given on the old or new Ordnance Maps, and I could not learn that any trace exists. Just within Kilnaboy parish lies Lissyogan, an oblong earthwork, 100 feet by 150 feet on Knockaunadrankady (Little Hill of the Fleas) in Moherbullog, while Cahergal in Maghera is a barely visible ring of filling on a pleasant hillock on the flank of Inchiquin Hill, overlooking the green valley towards Applevale. In the closing section of this paper I hope, so far as I am able, to conclude my survey of the ring-forts of north-west Co. Clare by notes on those undescribed round Lisdoonvarna, and the results of farther examination of the district thence to Ballyganner ridge and the Kilfeneora road, so as to meet the present survey.